Welcome to “WARRIOR WEDNESDAY” and our very first “Migraine Warrior of the Week!” As explained in a previous post, each Wednesday a different migraineur will be featured on this blog. Any pictures that are provided, along with their answers to a questionnaire will be posted here, with the hopes of providing alternate perspectives with regards to migraine and other headache disorders. These people battle migraines with determination and bravery and deserve to be celebrated and spotlighted for the way they live their lives despite chronic illness. 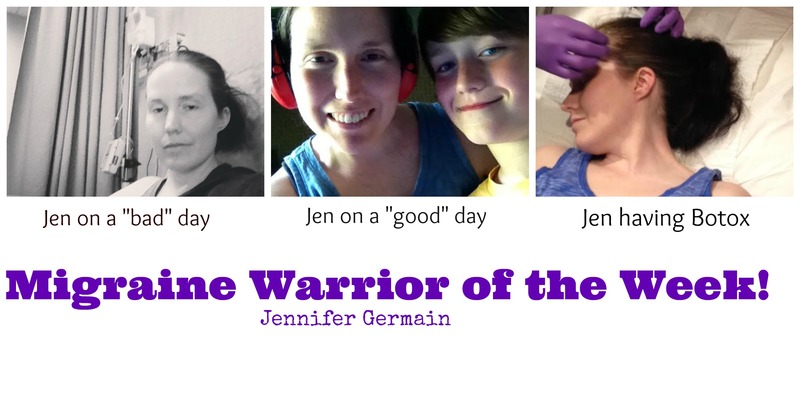 Some “Warriors” will make mention of their personal efforts to raise migraine awareness: blogs, websites, Facebook pages/groups, books, presentations, etc. I encourage them to do this because I want everyone to have access to as much information as possible. I encourage you to take a moment to peruse whatever they are doing to help and to consider what you, personally, can start doing to make migraines visible and to stop the stigma associated with chronic invisible illness. Tell us a little bit about yourself…share as much as you feel comfortable sharing. What do you do for fun? What are some of your interests/passions? I love to read, write, send cards to people who need a smile, clean (very OCD!! ), helping others. I really have so much fun throwing parties for large numbers of people at our house. However, I have been too sick to do so in the past few months-a year. Do you currently have a job (inside or outside the home)? What is it? Have you ever lost a job due to the disabling nature of your migraines? I work at home for my husband’s business. I do paperwork for the business as I am able…from my bed most often. At what age did you have your first migraine? At what age were you diagnosed? First migraine at age 21; was episodic until diagnosed with Chronic Daily migraines in 2004 at the age of 26. Describe a typical migraine for you. What does it look like/feel like? What symptoms do you experience? What kinds of activities are limited/impossible for you during a migraine attack? A typical migraine keeps me in bed all day. My eyes become puffy and I become severely nauseated. It feels like my right eye will pop out of my head and if that happened it would be soothing to pour cold water directly on my nerves. I sleep a lot when I have a migraine and I can’t even laugh or smile or cry. That all takes too much energy. It’s impossible for me to drive with a very bad migraine. We have had to hire a nanny to help take care of the boys because they need so many rides to different places. It makes me feel like a bad mom that I cannot do this stuff myself. Having a bad migraine makes me very emotional. People tend to associate migraines with pain in the head. Other than head pain, what would you say is the number one symptom of your migraines that is the most debilitating? What are your migraine triggers? Everything! Okay, here’s a list off the top of my head: perfume, cologne, smelly deodorants, cigarette smoke, hormones, lack of sleep, the sun, heat and humidity. Currently, I am doing Botox every 10 weeks, taking Amerge twice a day as a preventive and also taking Neurontin twice a day for prevention. This is proving to be my best combination yet although the migraines are far from controlled. Massage therapy helps very much as well to remove tension and tension triggers a migraine for me. Other things I have tried and they have not worked include: Verapamil, Topamax, Depo-Provera shot, Riboflavin, Depakote, Proponal, Progesterone, etc. I have tried many alternative therapies such as acupuncture, cranial-sacral therapy, physical therapy, dietary changes, and many all natural supplements. How have migraines changed your life and the life of your family and loved ones? Migraines and my other chronic illnesses have changed my life completely. I used to be a very energetic young woman who was always in good health and on the go. Now I am bedridden, ten years later, and each day seems harder than the one before. Migraines have affected my loved ones. My husband worries about me, feels sad that I cannot accompany him on outings like I used to and feels frustrated that he can’t just fix me. Migraines affect my kids. I am no longer the soccer mom I used to be. Now their nanny brings them to sports practices and games. We all miss out on things because I have migraines. And many people inmy extended family do not understand and their lack of compassion is what can spiral me into depression like nothing else. What emotions do you associate with your migraines? Guilt, sadness, anger, frustration, doubt, self-loathing, isolation, exhaustion, fragility. What is the worst thing a person can say or do during a migraine attack? The worst thing a person can do during a migraine attack is think there is nothing they can do to help. There are so many ways that anyone could help me. Give non-migraine patients some tips on how to be helpful, both during an attack and in everyday life, with regard to migraines, chronic pain, and invisible illness. If you could convey one thing to the general population about migraines, what would it be? I would like to convey that you can’t judge a book by its cover! Do you participate in any advocacy work for migraines? Is there a link (or links) that you would like to share, such as for a blog, Facebook page/group, or website? Do you battle any other diseases/illnesses/disorders other than migraines? Yes, I do. I also have Gastroparesis, Celiac Disease, Hashimoto’s, anxiety, depression, panic attacks, Raynaud’s Syndrome, IBS, and both heat and cold intolerance. Sounds like Jennifer has a beautiful and supportive family with strong loving friends. I am sad for her pain, happy for her support and hopeful for her future. Thank you for sharing. She is really a migraine warrior!